Cars and kids can be a dangerous combination. Taking proper precautions to be sure that your child is safe in and around cars and reduce his risk of injury or death. Being aware of potential dangers and knowing how to properly protect your child can help to create a safer environment for your child. While most parents are aware of importance of buckling up and driving responsibility, it never hurts to review car safety tips for kids. 1. Choose the proper safety restraint. There are many different types of car seats. According to TheCarSeatLady.com, the safest, best car seat is the one that will fit securely in your vehicle, that fits your child’s age, height, and weight and the one that you can operate correctly every time. Educate yourself on how to choose the appropriate type of car seat, the importance of extended rear-facing and how to get your car seat installation checked by a certified child passenger safety technician. 2. Don’t allow distractions. Distracted driving can cause accidents. Fighting, yelling and screaming can agitate the driver and cause the driver to lose focus. Talking on the phone, texting, eating and other distractions can also lead to accidents. If the kids are fighting, pull over. If the phone rings or alerts you to a text message, wait until you are safely at your destination to answer or respond. Establish clear rules for acceptable car behavior and enforce them. 3. Be cautious of the blind zone. The blind zone is the area behind a vehicle that the driver can’t see. The blind zone is measured as the distance away a driver has to be when looking in the rear view mirror to see the top of a 28 inch orange traffic cone (about the size of a toddler). Depending on the driver’s height, the blind zone can be between 9 to 49 feet or more. Many backover accidents occur when children are in the blind zone. Before backing out of any spot, check behind your vehicle and if your children were near you, be sure they are in your sight while backing out. 4. Beware of power windows. Did you know that children have actually been injured and even killed by power windows? The force power windows can exert is enough to fracture or crush bones, or even strangle a child. In fact, according to the National Highway Traffic Safety Administration, 2,000 emergency room visits each year are caused by power windows. 5. Never leave your child in the car unattended. On a hot day, it only takes minutes for the temperature inside the car to reach levels that can cause injury or death. According to KidsandCars.org, on average, 38 children die in hot cars each year from heat-related deaths after being trapped inside motor vehicles. These deaths are preventable. Be sure all the adults involved in your child’s care are reminded of the dangers that occur when children are left in cars. 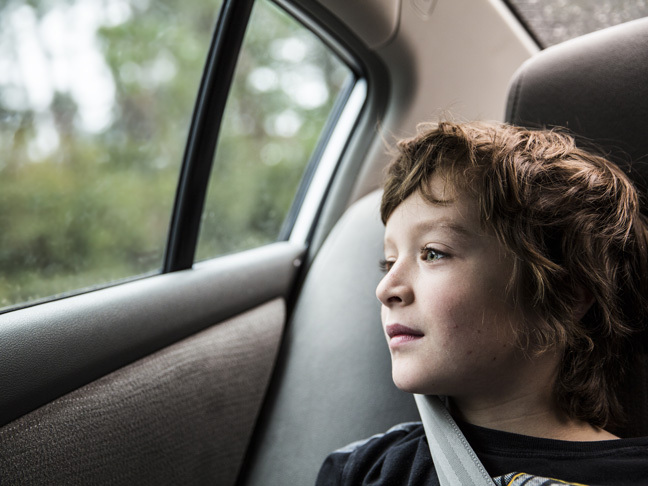 What measures do you take to keep your child safe in and around cars? Please share your car safety tips in the comments below.